I knew the Alzheimer’s had taken over. Debbie Borque on feeling defeated by a disease. Debbie Borque is a 60 year old family caregiver from Biddleford, Maine. One thing she makes plain is that even with a community to rely on, even with the deep fulfillment that comes from caregiving, modern caregiving can feel like a personal defeat. Debbie knows is just doesn’t have to be this way. Something like the Homecare for All initiative on the Maine ballot this November 6th, would make all the difference between having meaningful, fulfilling care centered on dignity and a defeated present looking at an uncertain future. I met Roland when I was 16 years old. I knew when we met that he was the person I wanted to be with for the rest of my life. He fought it, but I knew. We dated for five years, got married, and had two children very young. I can’t say we had a perfect marriage, but it’s as perfect as I can imagine. We’ve been married for 39 years. We always respected one another, and never tried to change each other. That’s why we had a good marriage. Six years ago, when Roland was 57, he was diagnosed with Alzheimer’s disease. When I first learned about his diagnosis, my first thoughts were “I am dealing with a disease that has no cure.” Still, we had so much fun together, even during the beginning of his disease. Eventually, though, he started forgetting that I was his wife. As difficult as that was, I just had to learn to accept it. The entire experience of caring for a loved one with Alzheimer’s is about adjusting to a new normal, but how can you adjust when the new normal is constantly changing? Sometimes everything would be going perfect: we would go to the beach and enjoy one another’s company, but when we came home, one tiny thing would set him off and he would get so angry. In those moments, I knew the Alzheimer’s had taken over. When that happened, it became frightening to think about what the future held for us. This one cruel twist of fate has changed the path of our lives forever. Even so, it has been a comfort to care for him as my role changed from wife to caretaker. From the very beginning, I knew, in my heart, that I wanted to keep Roland home with me until he succumbed to the disease. It just didn’t seem right that, at 62, he would have to go into a facility, and be far away from his children. But I could never have imagined how difficult this journey would be. In the beginning, I thought, “I can do this… I am a strong person. I have had my own health issues and have even faced death.” But as time went on, things surfaced that I had never thought about before. I had to help my husband bathe and use the bathroom. I couldn’t even take a shower because, in the time I would be in the bathroom, he could get into so much trouble. The grocery store we go to is literally across the street from our house, but it had reached the point where going to the grocery store was like a day’s work! We were fortunate to have someone who came to take care of Roland, but since I had to pay out of pocket, it was only for three hours a week. The financial costs of Roland’s care have been huge. I had to stop working. I own and operate a cleaning business, and in order to be with Roland, I’ve had to cut back on the cleaning considerably. Whenever I could, I would sneak away from work to make sure Roland was doing okay, and when I couldn’t, my son-in-law would check on him. We have a community of people, but there aren’t many people we could depend on during the day to take care of Roland, because everyone works. Money has been so tight so tight while paying for the care that Roland needs, and whatever money we had saved for retirement is quickly depleting. My income has been cut down considerably. I am 60 years old – I still need money to live on. I keep thinking – what am I going to do when I run out of money? I am sad to say that I feel like the disease has won: I recently had to put Roland in Sedgwick Commons, a nursing home in Falmouth. I feel defeated. I think of myself as a strong woman, but I have met my match in Alzheimer’s. I don’t want this for anyone else, ever. Maine Homecare for All would have been the be-all-end-all-for me. I just needed someone to come in to help Roland so I could go to work for a few hours or run errands. That little bit of help would have meant he would be able to get the care he needed, and would have allowed me to continue to work and contribute to our community. Knowing that he was safe, and that he was around people, would have been monumental. He has always been a people person. 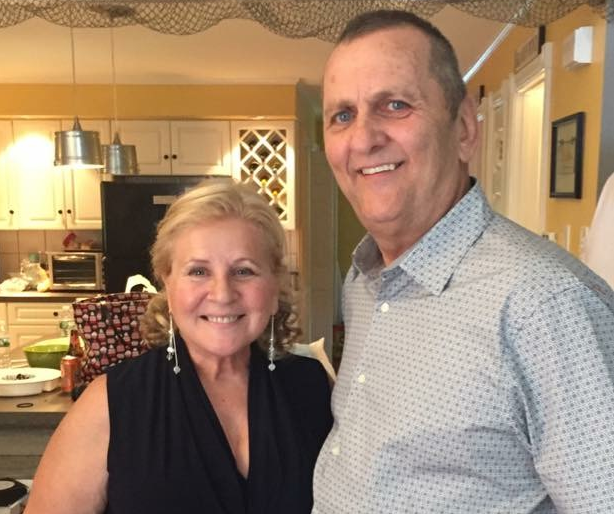 If we could depend on Maine Homecare for All, Roland would still be with me at home, and I believe that his disease would not be as advanced because he would be around the people he loves. Long before Roland was diagnosed with Alzheimer’s, I always felt like our elderly population was not respected. Without them, none of us would be here. I support this important campaign, because we need to make sure Maine seniors can live with their families, in their own homes, and on their own terms. And the people who do this vital work of caring for our loved ones must be paid decent wages. Follow the stories and experiences of Debbie and others and join in the conversations about how we create community and break the isolation of caregivers on our Facebook page and on Twitter using the hashtags #WeKnowYouCare and #NationalCaregiversMonth.